Stade de France will be stage to international football once more! The next championship will be hosted in France for the UEFA European Championship, commonly referred to as Euro 2016. Euro 2016 will be held in France from June 10th to July10th 2016. 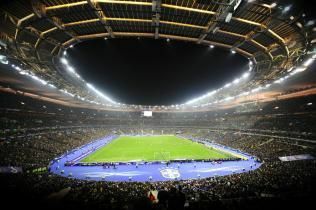 Stade de France is one of France’s famous stadium-venues ; one of the ten French stadiums selected all over France for the European Cup. The European Championship will be contested by twenty-four teams for this highly prized cup. Seven matches will be played on the pitch at Stade de France in Saint Denis: Four pool-Group-stage-matches, a Round of 16 matches, a Quarter-final match and the Final. Save the dates for your chosen football match. Dates and times are confirmed even if all the teams are not yet known. As the host Country of Euro 2016, France is automatically qualified and will have the privilege to play the first match of the competition on June 10th 2016 at Stade de France, a home advantage at a stadium that frequently hosts important international games. Make the most of your visit to Saint Denis and the French stadium Stade de France and take pleasure in the amazing things to view in the numerous landmarks of this Royal destination -Saint Denis. Enjoy a walking sightseeing tour of this medieval city. Enter the gothic architecture and crypt of the Royal Basilica of Saint Denis. Check out our list of accommodation near Stade de France and click on our page dedicated to access to the stadium to prepare your arrival in advance. Don't miss the street art guided tours along the canal Saint-Denis and many more events related to the Euro 2016 competition : Football, a state matter free exhibition, Foot Foraine La Villette and some things to do. Numerous hotels are situated near the stadiums. Consult our practical page to choose your hotel in Paris or Saint-Denis during Euro 2016.